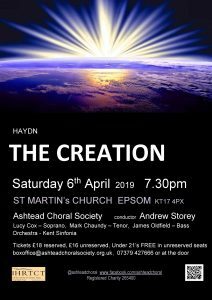 Ashtead Choral Society invites you to come and enjoy The Creation by Joseph Haydn. Haydn’s oratorio, considered by many to be his masterpiece, depicts and celebrates the creation of the world as described in the Book of Genesis. The concert features the Kent Sinfonia and soloists Lucy Cox, Mark Chaundy and James Oldfield.